When I watch his videos like Mall Pranks, which has been seen 7 million times I just shake my head in amazement that someone who was recently Marketing Director at Merck & Company could create such stuff. Nalts as he’s known to his many fans has just released a new book called Beyond Viral which is part of my New Rules of Social Media book series. 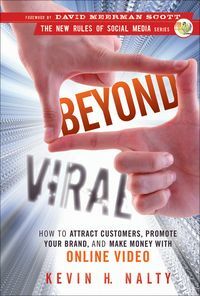 Beyond Viral is about how to Attract Customers, Promote Your Brand, and Make Money with Online Video. Whether you’re a CEO, marketer, agency leader, or entrepreneur, Beyond Viral will provide actionable ideas and plans that can save you from the many pitfalls and help you market successfully via online video. Consider it four years of intensive practice – as a marketer and entertainer – packed into one book. In fact when I sat down with the manuscript, I read it in one sitting. But I learned a lot too. Don’t expect this to read like your typical business book. Beyond Viral is written by a guy who manages to be taken seriously by major corporate clients... when he’s not secretly videotaping people’s reactions to him crawling through airports, pratfalling in the snow, or having fake panic attacks in NYC cabs. Check out the Best of Nalts video playlist. Here was a guy who could generate more YouTube views in the time it takes to walk around the block than I had amassed in my entire life. But Kevin is about much more than just doing silly videos like his Farting in Public (now seen more than eleven million times). His perspective as both a YouTube celebrity and a marketing professional gives him a unique perspective on what works and what doesn’t in the uncharted waters of viral videos. I knew Kevin would be the best person on the planet to write a book about using video to attract customers, promote brands, and make money. I am thrilled he agreed to write this book.